Well, it sure isn’t me. I once spent 5 entire days and nights on our farm without going anywhere, seeing anyone. You can do that when your house garden shares no common boundaries, when your nearest neighbour is a hill away. 5 days though was extreme, even by my standards, and on the 5th day, I unfortunately caught a glance of myself in the mirror. It was a grounding moment, and sadly, not an isolated one. You see, things in my life are dropping – my skin, my bank account, anything in the house that a 1yr old can reach – and a 4yr old too for that matter – , and regretfully, my personal care. Whilst I would like to think I dress for myself, I obviously dont, because when no one is around (children excepting – they are always around), my standards drop. Recently, however, I would say that I hit a new low. Life, it seems, has indeed got the better of me. Fresh from my shifts in Sydney, where all of my and my children’s needs were met by family, this day began at 5.10am, when a young ear-achy Baby James decided to wake up. After all, hadn’t he heard a single bird (must have been an owl) sing, announcing the start of the new day (where’s that slingshot)? It was all downhill from there. Baby James’ protests as I attempted to resettle him then woke 4yr old Thomas. Before I knew it, we were all up (Dougall is away, but he wouldn’t have been up anyway as he suffers from the ‘incredibly immune to sound whilst slumbering’ syndrome, a feature very prevalent in men, I understand) and there was no turning back. I won’t go into what happened over the next hour or so, except to say I ended in a catatonic state on the couch (how DID that bowl of porridge not smash from my throw? ), swaying and mumbling to myself like an animal in a 3rd world zoo while Thomas clambered over me saying ‘I love you Mum’… (and how do they move on so fast?). So I find the minute – that’s normally all I get, a minute – to jump in the shower where I try to harness some calming yoga breathing. I recall with fond memories all that home help during that work spell I had in Sydney recently. Ahh, the tyranny of distance. On my own up here, Thomas is planted in front of the TV, and James is asleep. At least, he was asleep, until Thomas starts calling for me at the top of his voice, not for any reason, but just because he likes to know where I am. So out I rush. ‘Well’, I say, trying to control my simmering fury, exhale slowly, inhale deeply, exhale slowly, inhale deeply, ‘at least we don’t need to wait around now for him to wake up. We can actually get to the markets at a reasonable time’ (country markets, unlike urban ones, are all over by 12. As a time challenged family, it’s always a rush). Even so, we don’t manage to get into the car until 1045 (how does that happen?). Happily, we remember to shut the farm gate (actually, I’ve never forgotten, but it has happened, twice. You know who you are. My claim to fame instead is leaving Dougall’s beloved mobile phone on the roof of the car, before driving off at 100kms an hour onto the highway. Amazingly, the phone survived, scattered across a radius of 50m or so. Have just realised that I’ve always let Dougall believe it was he who put it on the roof, and I’ve just publicly confessed that it was me. Hmm… will leave it in. It’s time he knew). …Where was I? Right, the market. Going to the local market is traditionally a lovely way to spend a Saturday morning. People are milling about, relaxed, taking their time, catching up with friends and neighbours who they don’t often get to bump into, buying delicious locally grown and made produce from local (for the most part) stallholders. Put simply, market day is a social event. Emerging from the car I realise my hair, recently made short, is sitting on my head like a windblown toupee with too much fertiliser, as I haven’t had the opportunity to ‘do anything with it’ (that’s the problem with short hair, you have to do ‘something’ with it as soon as you get out of bed). I step out, then just as quickly, step back in. Nabiac, let alone me, is not ready for stripey pink, black, white and blue socks with lime green thongs. How …? The image of the morning trek to the compost pile comes into my head, the thongs casually thrown on to protect my socked feet from the morning dew. (I once unknowingly went to work from the farm on an early commute with my ugg boots still on. That was tricky from a professional point of view). Thankfully, this fashion ‘faux-pas’is easily remedied. 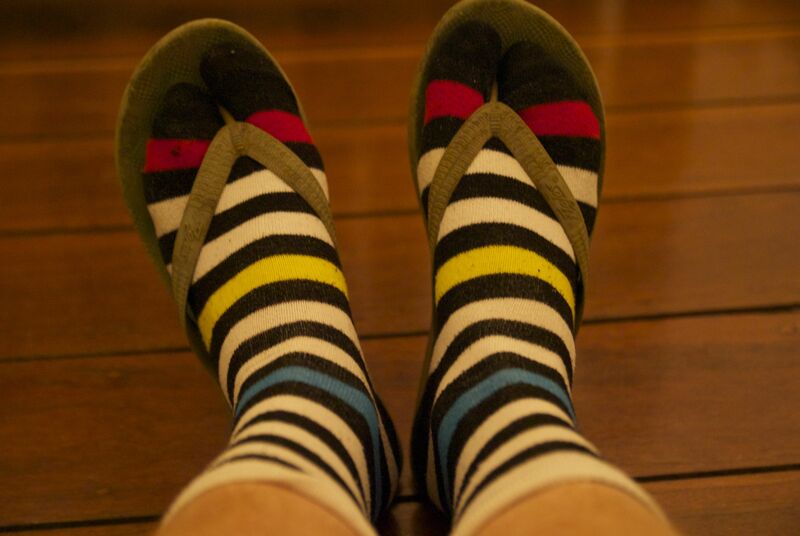 I whip off my stripey socks and step out in thongs – admittedly, it’s a little early in the year, but it’s the only option – and off we go. Phew. Disaster averted. It’s not until later that afternoon, in the safety of my own home, that I realise I’d walked around the whole market with my entire singlet hanging down around my waist. Damn. What a day. To view images from our local Farmer’s Market, click here. This entry was posted in Kids in the country, Life in a small community, Living with animals by Bec C. Bookmark the permalink. Hilarious! I love the photo. I really love your stories – having brought (some say dragged…ha, ha) up two children it’s somehow reassuring to read about the current generation facing the same dilemmas. The story is the same just the players are different! My daughter is a new Mum and whilst I find some of her dilemmas quite amusing, she can’t seem to see the funny side……… Keep up the good work! Thank you so much Vicki – good to hear you made it to the other side still sane… Reassuring for me! Hi Bec – who said I am sane? I’m still suffering the facial ticks and intermitant screams………………….. I knew it!!!! I could never work out how my phone got off your aunty bettys table … next to the scones and cream… And onto the roof of a speeding car… Without me touching it. That’s why they call them ‘smart phones’ darlin’ – it’s amazing what they can do! Now you know that when I’m wearing a bandana, or hat, or scarf, or some other head gear, it’s not because I’m trying, in vain, to be cool. It’s a desperate attempt to tame wild short hair. Do people with long hair ever have a bad hair day? great story! – love the ending with the singlet – did it have holes in it?